Every one knows the glory of love, and its place in human hearts, and among the living beings. My this sketch is a trial to illustrate that love, in my words “Love is a kind of feeling which is not be caught within the boundaries of a physical body, it is simply a wish to keep something in our grip, whatever it is, like honey for a bear, or reproduction of flowers in another medium say from bees.” See it also a feeling of joy which spreads on over face when we see a beautiful flower, growing in our garden, or in flower market where many types of flowers brought for sale. 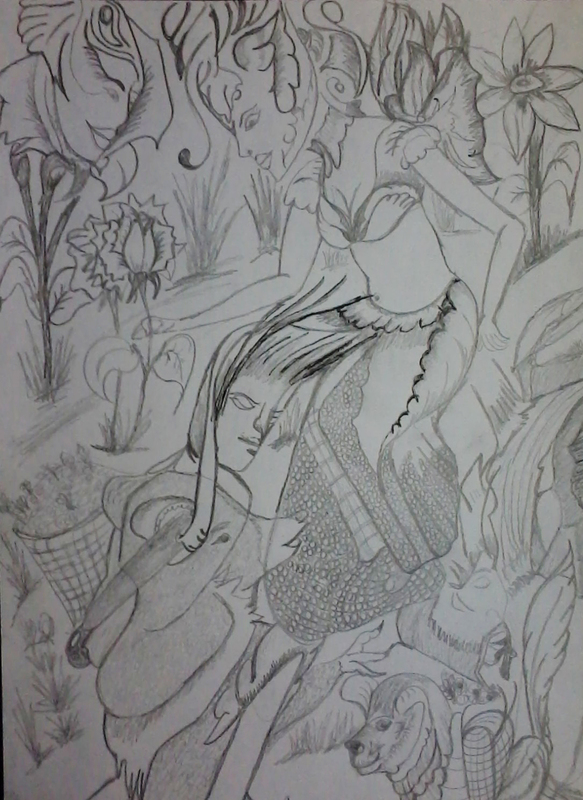 You see in this sketch what i did, if it resembles my idea then please let me know, waiting for your comment………. If only everyone understood “love” as clearly as you do. It really does go beyond the material world and has no constraints. It is good to have a non Western perspective. I enjoy your sketches so much. I hope your work is going well, and that you are, too. You have an excellent vision of humanity’s natural connection to the environment and other living things. Your sketches illustrate this well, shown in the weaving of shapes into the scene that are flora, fauna, and human as one and separate entities at the same time.